Network ready laser printers with highly capable paper handling facilities are not particularly thick on the ground. 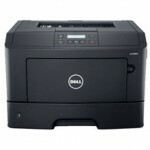 But Dell is looking to partly rectify that situation with the quietly impressive Dell B2360dn laser printer. The Dell B2360dn speed and paper handling make it a good fit as a shared monochrome laser printer for heavy duty printing in a micro or small office or workgroup.